Search for a consultant by ID, email, or URL, or select from your recently visited to change who you're shopping under. You'll always receive wholesale pricing on all Thrive Life products when purchasing from a Thrive Life Consultant. 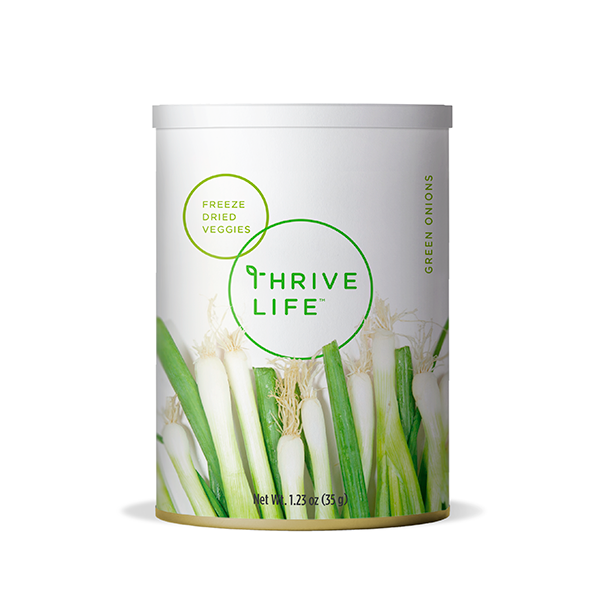 THRIVE™ Green Onions give the perfect finishing touch to rice dishes, soups, or steak. These tasty morsels are chopped and freeze dried, so you don’t have to worry about spoiling or spend valuable time chopping. Their extended shelf life means you’ll always have a great garnish on hand. With THRIVE Green Onions, it’s easy to sprinkle savory flavor into all your favorite dishes. *Shelf life based on optimal storage conditions. All products are processed in facility that handles milk, egg, soy, wheat and tree nut products. Add 1/4 cup of lukewarm water to 1 cup Green Onions and let sit for 2-3 minutes or until tender. Click here to view the THRIVE to Fresh Equivalents Chart. If you’re using them to top a dish, they’re just as tasty dry and don’t have to be rehydrated. Our Green Onions only include the green leaves of the vegetable and are great for adding color, adding flavor to rice dishes and more. Free and discounted shipping (5% shipping charge in Alaska and Hawaii) is now available on ALL items for deliveries $100 or more! Pantry Organizers, Buckets and large packages are not included.